In the Ford Environmental Science and Technology Building, the office of Martha Grover is three doors from that of Jennifer Glass. Both are Georgia Tech scientists doing research related to astrobiology – life in the cosmos – but until last year they hardly talked to each other as researchers with common interests. “We are all so busy,” says Grover, a professor in the School of Chemical and Biomolecular Engineering, a scientific collaborator at the NSF/NASA Center for Chemical Evolution (CCE), and a member of the Center for Space Technology and Research (C-STAR). Now, Grover, Glass, and others at Tech are members of a growing community that’s coalescing astrobiology activities across campus. In a public debut of sorts, six members of Georgia Tech Astrobiology, as the community calls itself, participated in the 2017 Dragon Con, the premier pop-culture convention on science fiction and fantasy. They wowed the audience, not by fiction or fantasy or over-the-top costumes, but by progress in answering fundamental questions – How did life begin? Where else could life exist? – happening right next door from the meeting venue, at Georgia Tech. The community includes physicists, chemists, biologists, Earth and planetary scientists, and engineers, as well as historians of science and writers. The scientists are figuring out how life emerged and evolved to the biosphere we know, inventing instruments to detect life outside Earth, and searching for other habitable places in the universe. The science historians and writers are witnessing science in the making and perhaps gathering fodder for the next volume of science fiction. 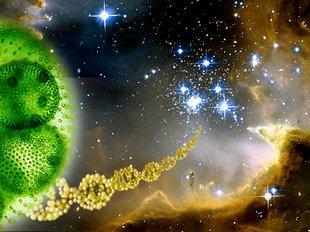 Broadly defined, astrobiology is the study of life in the cosmos. Its central questions are “What is the origin of life?” and “Does life exist beyond Earth?” Humans have asked these questions since time immemorial. That they are still around attests to the difficulty of discovering and assembling the pieces of a formidable puzzle: the emergence of a biosphere on a planet. At Georgia Tech, research teams are working across the breadth of questions central to astrobiology. Their activities are exemplified by three specialized research groups: CCE, NAI-GT, and C-STAR. 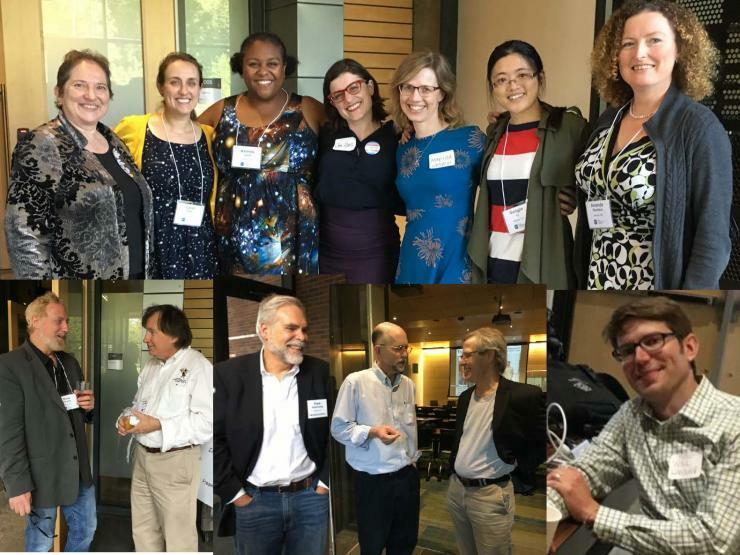 CCE is building a community in origin-of-life research, said its director, Nicholas V. Hud, at a symposium organized by Georgia Tech Astrobiology last month. In finding answers, CCE takes two approaches, Hud explained. “Bottom up,” it starts with geology and chemistry and understanding the formation of the first polymers of life, which is a major focus of Hud’s. “Top down,” it starts with biology, genetics, and looking back in time at persistent, conserved molecular motifs, as exemplified by the work of Loren Williams on ribosomes. Like digging a tunnel underground from opposite ends and meeting somewhere in between, the two approaches are converging on the coevolution of the biopolymers of life. Chemistry and biology are telling us the same thing, say Hud and Williams, both professors in the School of Chemistry and Biochemistry (SoCB) and members of the Parker H. Petit Institute for Bioengineering and Bioscience (IBB). At NAI-GT, “we start at the level of the cell,” says Frank Rosenzweig, the School of Biological Sciences (SoBS) professor who leads the NASA group. “Once you have all this biochemistry wrapped in a cell, what happens then? How do they become associated as multicellular organisms? How do they engage in biochemistries that change the environment? We need to understand the interaction between the evolution of life and the evolution of its abiotic surrounding to have a chance of recognizing life elsewhere. “Although life on Earth manifests in different forms, all are governed by laws of growth, inheritance, and variability,” says Rosenzweig, also a member of IBB. NAI-GT aims to “illuminate and interpret these laws via laboratory-based evolution experiments with microbial populations.” An example is the exploration of the origin of multicellularity by experimentally evolving yeast, as described in the September symposium by Will Ratcliff, an assistant professor in SoBS. For C-STAR-affiliated faculty, habitability is one key question. What events and conditions in the abiotic sphere yield environments that support life? The NASA-supported work of Jennifer Glass and Chris Reinhard, in the School of Earth and Atmospheric Sciences (EAS), exemplify the search for answers in this realm. What signals should we monitor in search of life elsewhere in the universe? What tools do we need to probe for signs of life from the comfort of Earth? What hazards should we prepare for if humans were to go to other worlds? In EAS, C-STAR members and planetary scientists Carol Paty, Britney Schmidt, and James Wray are co-investigators of NASA-funded projects to answer these questions. So is C-STAR member Paul Steffes, in the School of Electrical and Computer Engineering, as well as C-STAR Director Thomas Orlando and C-STAR member Amanda Stockton, in SoCB. With the talent on campus, Georgia Tech is becoming well known in the field of astrobiology. 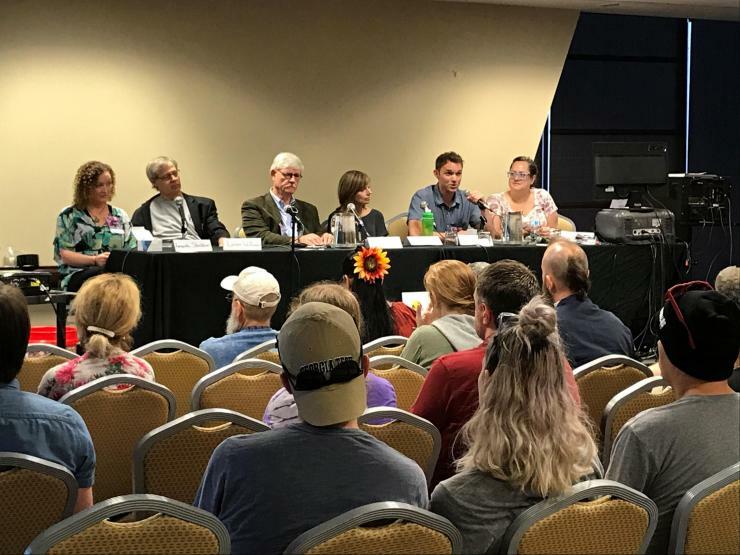 At the 2017 Astrobiology Scientific Conference, in Mesa, Ariz., last April, the Georgia Tech “posse” numbered about 30 faculty and students. Last summer, attendees of AbGradCon (Astrobiology Graduate Conference) 2017 selected Georgia Tech to host the 2018 event. This popular meeting for students is funded primarily by the NASA Astrobiology Institute. The community – now 85 strong and growing – is raring to make its presence felt. It has an ambitious schedule for the 2017-18 school year, spearheaded by the September symposium. Led by Grover as principal investigator, and with contributions from Glass, Knoespel, Paty, Reinhard, Rosenzweig, Schmidt, Williams, and others – Rebecca Burnett, Ivan Allen College of Liberal Arts; Glenn Lightsey, School of Aerospace Engineering and C-STAR; and Christopher Parsons, CCE – their proposal for seven projects received funding from the Georgia Tech Strategic Plan Advisory Group (SPAG) and the Colleges of Engineering, Liberal Arts, and Sciences. The projects aim to showcase the quality and variety of astrobiology projects at Tech, highlight the social impact of these projects, and strengthen the sense of community among faculty and students. The goals will be achieved through formal gatherings, educational innovations, and public outreach. Note: This list is not meant to be comprehensive; it represents information that was available as of October 2017. This list was updated on Nov. 21, 2017, to include all members of the NAI Team at Georgia Tech School of Biological Sciences.